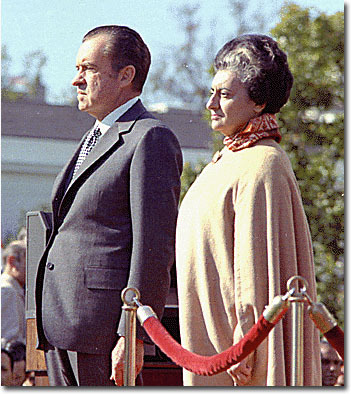 "Nixon's dislike of 'witch' Indira"
"Nixon documents show India tensions"
Earlier this week, the Office of the Historian at the State Department hosted a major conference on U.S. policy in South Asia focusing on the 1971 India-Pakistan war triggered by the crisis over Bangladesh. (Note 1) Much of the discussion focused on, and flowed from, a new volume of documentation edited by Louis J. Smith for the FRUS series. (Note 2) Besides including the usual cables and memoranda, the editors of this volume made significant use of the White House tapes and the transcripts of Henry Kissinger's telephone conversations. "This volume deserves the attention of the widest possible readership because of its fascinating, sometimes startling, revelations on Nixon administration policy. It gives the reader an unparalleled perspective on the inner workings of White House policy throughout the crisis," said Dr. William Burr, senior analyst at the National Security Archive, who attended the conference. Triggered by East Pakistan's (now Bangladesh) quest for independence, the 1971 crisis quickly raised human rights issues because of what White House officials characterized as a "reign of terror" (Note 3) orchestrated by Pakistani forces. While consular officials in Dacca, East Pakistan privately criticized the U.S. government's "failure to denounce atrocities," (Note 4) Nixon and Kissinger did not want "to get [the] West Pakistanis turned against us," in part because President Yahya was providing a secret communication link for their quest for rapprochement with China. (Note 5) The close China-Pakistan relationship was central to Nixon's wish to "tilt" U.S. policy toward Pakistan in part to show Beijing that Washington would support its allies. (Note 6) With Pakistani refugees fleeing into India, the crisis quickly turned into a clash between India and Pakistan. Quickly defining and dramatizing a regional national/ethnic crisis in geo-political terms, Nixon and Kissinger saw India as a Soviet client state that was determined to weaken Pakistan fatally. China, however, had a close relationship with Pakistan and Nixon wanted to "tilt" U.S. policy toward Pakistan to show Beijing that Washington would support its allies. Nixon was not as sure as Kissinger that Beijing and Moscow would go to war and when General Alexander Haig met with the Chinese later that day, Nixon and Kissinger learned that the Chinese had not made any military decisions but would call for a cease-fire and mutual troop withdrawal and support a stand-still cease-fire if necessary. 1. For the agenda of the conference on "South Asia in Crisis: United States Policy, 1961-1972 South Asia in Crisis: United States Policy, 1961-1972," see http://www.state.gov/r/pa/ho/46059.htm. 2. U.S. Department of State, Foreign Relations of the United States, 1969-1976 South Asia Crisis, 1971, vol. 11 (Washington, D.C., 2005), available on-line at < http://www.state.gov/r/pa/ho/frus/nixon/xi/index.htm>. For the Department's news release on the volume, see http://www.state.gov/r/pa/ho/frus/nixon/xi/45652.htm. For an earlier compilation of declassified documents published by the National Security Archive, see "The Tilt: The U.S. and the South Asian Crisis of 1971, National Security Archive Electronic Briefing Book No. 79, Edited by Sajit Gandhi, December 16, 2003 at https://nsarchive.gwu.edu/NSAEBB/NSAEBB79/. 3. Item 13 at http://www.state.gov/r/pa/ho/frus/nixon/xi/index.htm. 4. Items 19 and 20. 6. For "tilt', see item 218. 7. Professor Robert J. McMahon observed during the State Department conference that the documents in the FRUS volume confirm major points--such as the White House’s geopolitical emphasis and Nixon and Kissinger’s strong bias against India and toward Pakistan---made by critics who have dominated the historiography of the crisis. See Dennis Kux, The United States and Pakistan, 1947-2000: Disenchanted Allies; Raymond Garthoff, Détente and Confrontation: American-Soviet Relations from Nixon to Reagan; William Bundy, A Tangled Web: The Making of Foreign Policy in the Nixon Presidency; and Christopher Van Hollen, “The Tilt Revisited: Nixon-Kissinger Geopolitics and South Asia,” Asian Survey 20 (April 1980): 339-361. 9. Items 239 and 251. 15. Item 281 at page 779.